Now that I'm almost back to full health we are back to practicing writing. 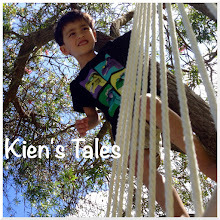 Here's Kien's latest little story. If you haven't heard of The White Rabbit Project, it is a Netflix series that was a spin off of MythBusters, and produced by the same company. I've written a few little notes for Kien to discover in his lunchbox. He then thought it was funny to write a note back!